Here's the full Frankfurt Motor Show round-up. What a show! The star of Alfa's stand was the 4C concept. It's no different to the Geneva show car, other than it's painted silver. Still, isn't it gorgeous? Alongside were the updated MiTo and Giulietta models with new gearboxes and things. Following on from the debut of the concept version in Pebble Beach, and the racing version at the Nürburgring 24-hour race, Aston Martin announced that the V12 Zagato will go on sale in limited numbers. This is technically the world debut of the production model. Audi may as well have held its own motor show it had so many new models to exhibit. There was the A8 Hybrid; four new S cars powered by a new twin-turbo V8 (S6, S6 Avant, S7 Sportback and S8); the A2 concept (an electric five-door hatchback to rival the BMW i3); facelifts for all the A5s and S5s (coupé, Cabriolet and Sportback) and RS 5; and the unusual urban concept in coupé and spyder guises. The stand itself was awesome too, boasting a track where showgoers can hitch a passenger ride in a selection of new Audis - and electric prototypes. New Bentley Continental GT comes along; new Bentley Continental GTC follows. Same rules apply: its creases are slightly sharper, but it looks almost identical. It has more space, is quicker and has a better quality interior. Job done. While BMW's stand was chock full of new cars, it perhaps lost out on column inches by telling us about them all ahead of time. The i3 and i8 electric cars are the big news, though other debuts included the BMW M5 and new 1 Series. As ever the Brabus stand was full of highly tuned Mercedes-Benz models painted in light-absorbing black paint. We knew that a tuned SLK was going to star, but it got lost behind a wall of new '800' models (yes, that's 800PS), including the 230mph Rocket, based on the Merceds-Benz CLS. Two versions of the E-Class stood out though, and not just because they're white. One is all electric while the other is a diesel-electric hybrid; both use a new in-wheel electric motor under development in the UK. The extravagant Cadillac Ciel was the star of Pebble Beach, and Caddie kindly shipped it over to Germany for this show. Spectacular. The Colorado Rally Concept is a Chevrolet pick-up with rally aspirations. Not too relevant in Europe. The Malibu, however, will be pitched as a budget alternative to the Vauxhall Insignia, which means it should be very good value indeed. Meanwhile, the Miray Roadster concept is a speedster of no real consequence to Chevrolet - it'll never make it, but it is the sort of thing that motor shows are made for, all carbon fibre and 2020 design. Citroen focused on its DS models in Frankfurt, especially the new DS5. It will be the first Citroen to feature a full hybrid drivetrain - the 200bhp HYbrid4. There was a fleet of them ferrying journalists around outside and they look interesting - in a good way. Not as interesting as the funky Citroen Tubik concept van mind. Hats off to fledgling British car maker, Eterniti, for drumming up plenty of hype ahead of its launch in Frankfurt. The Hemera is a little disappointing, in that it doesn't look all that different from the Porsche Cayenne it's based on, but the company has big plans. We'll give it a chance for now. Yum. Its arrival was as predictable as Joey Barton Tweeting his feelings on any given hour, but that doesn't stop us getting giddy with excitement about it. Yes, celebrity chefs can finally stop thinking about what to buy next, because the successor to the F430 Spider is here. The gorgeous 458 Spider uses a folding metal hard top, yet it doesn't look horrifically off-balance. Star of Fiat's stand was the all-new Panda. Its curvy styling has evolved nicely, while the interior looks funkier and is bigger. Fiat's excellent TwinAir engines will feature as well. An all-wheel drive version of the Freemont thingy was on display, alongside a mildly refreshed Punto for 2012. You may have noticed that we're a bit in love with the Ford Evos concept car. It was one of the stars of the show, though the production ready Focus ST held its own - in both five-door hatch and estate guises. Then Ford went and revealed a Fiesta ST 'concept'. Just bloody make it, will you? Lest we forget, there was also a racing version of the Focus ST and the announcement that Ford's new three-cylinder EcoBoost engine will be slotted under the bonnet of the Focus next year. You can tell that the Civic was important to Honda by the lavishness of its pre-show event where the new Focus rival was revealed, suspended from the ceiling. The styling has evolved logically and Honda promises that it'll be better in every way than its predecessor. Is it that time already? It doesn't seem that long ago that the Hyundai i30 took the (admittedly low) Hyundai bar and raised it significantly, with its softy touchy plastics and general air of non-rubbish-ness. The new one was launched in Frankfurt, bringing Hyundai's renaissance full circle. It takes a lot of what's great about the Hyundai i40 and squeezes it into a car that is much closer to the Ford Focus and VW Golf than ever before. Hyundai also launched its i40 saloon at the show. The Jaguar C-X16 is a concept that looks like it's very close to production, reportedly due to be called XE when it arrives next year. 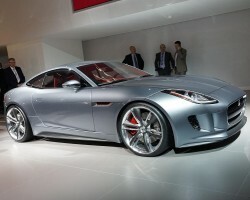 It will be significantly smaller than the XK and priced close to a Porsche Cayman. The new E-Type? Perhaps. Either way it was probably the overall show star. If we told you someone was coming to Frankfurt with a rear-wheel drive V8 coupé, Kia would be one of the last manufacturers you'd think of, right? Well, close your jaw, for here we are. It's your classic motor show frippery, granted, but once again it allows us to say how far Kia has come. Yes, let's have more reasons to perpetuate that one, please... Speaking of which, the facelifted Soul and the three-door Rio hatchback were also unveiled in Frankfurt. On one hand we openly admit to leering at the new Gallardo LP 570-4 Super Trofeo Stradale with desire in our eyes, but on the other, it's a tad disappointing that Lamborghini didn't make it lighter or more powerful than the Superleggera. It has more downforce though, which is reason enough to want it. Not one, but two DC100 concepts graced Land Rover's stand. The first, relatively conventional car we knew about, but the Sport version caused a few ripples. For the record, we like the look of the DC100, but not quite sure the Defender name needs to be used for it. Still, plenty of time before the next generation Defender actually comes to market in 2015. Remember the GS? Yes, you can indeed still actually buy Toyota's 5 Series rival. It's time for a new one now, which looks great, will be available as a hybrid, and has a stunning looking interior. Lexus also displayed the European CT 200h F-Sport for the first time. Dany Bahar must be taking all the 'WTF' press surrounding Lotus to heart as he made efforts to tell us that the company will not be abandoning the principles it was founded upon. So no future-looking concepts in Frankfurt, just the road-ready Evora GTE, a new look Exige and a rally car version of the same. Oh thank the Lord Maserati dropped the Kubang SUV into the mix in Frankfurt. We were worried all we'd have to talk about from the Italian company was the GranCabrio Fendi. Purists may not like that the Kubang is based on Jeep mechanicals, but it couldn't exist without them, and we're told that the engines will be made in Italy and of the high-performing variety. The car itself looks alright, in an Infiniti FX kind of way. The production version of the Minagi concept, the CX-5 is Mazda's answer to the Nissan Qashqai, Ford Kuga and all those other small crossover things that the cool cat parents are buying. It'll use the Skyactiv technology that seems to be like BMW's EfficientDynamics programme, but without even spelling one of the two adjoined words properly. The company also introduced a facelifted 3 hatchback. Mercedes-Benz duked it out for the 'most new cars launched' award with Audi and BMW. The ones we knew about ahead of the show included the new B-Class, the stunning C 63 AMG Coupé Black Series, new SLKs in 55 AMG and 250 CDI guises and the lovely SLS AMG Roadster. The night before the show opened Dr Z presented the F125 concept - a hydrogen powered vision of the luxury car of the distant future. Odd looking, but packed with innovation. We assumed that MINI would reveal its Roadster in Frankfurt, to complement the new Coupé, but it wasn't to be. Though it feels like it has been around for ages already this was actually the world debut for the Coupé. Peugeot's HX1 concept MPV looks fabulous. It purports to be as sporty and efficient as it is spacious. Who cares if it'll never see the light of day? The other significant new Peugeot on show was the production ready 508 RXH, featuring Peugeot's excellent HYbrid4 diesel-electric hybrid powertrain. We don't need to go over old ground too much here: the all-new 911 looks very similar to the previous one. That's how Porsche rolls. Saying that, we love the sharp new rear lights and the interior has undergone a significant redesign. There were other relatively new variants of the Panamera etc on display too, but really all anyone wants to see on the Porsche stand is the new 911. Another motor show, another ridiculous Renault concept car. This one is an MPV of some sort that also doubles as a mobile widescreen TV for anyone that happens to be walking past. Obviously it's electric. The new Renault Twingo dominated the stand though, in everything from vanilla to Renaultsport flavours. SEAT's surprise was the IBL concept car, an elegant four-door saloon that, contrary to popular opinion, does not preview a new Toledo or Exeo. Instead it shows how the next generation of SEATs will be designed. Neat. The facelifted Exeo saloon and ST estate were also on show, boasting new lights mainly, with detail improvements elsewhere. The latest electric smart fortwo was complemented by the company's ebike - yes, it's electric too. You may not notice them next to the very promising smart forvision concept car though. It has plastic wheels and everything. Alongside a new crossover called the XV, Subaru previewed its version of the much-hyped Toy-baru with its BRZ Prologue. As expected, it's a boxer engine slung low down in a chassis that has rear-wheel drive. No hint at its styling yet though. Always coming, it was. And it didn't take Yoda to work it out either. The first Suzuki Swift Sport is near iconic, and gave the Japanese moped maker hot hatch credibility pretty much as soon as it came out. Like the new Swift in general, the Sport will be much the same as the last one, but bigger. Nothing wrong with that. Loads to see on the GM stand. The significant production debuts included the tasty looking Astra GTC three-door hatchback and the all-new Zafira Tourer MPV. Next to those was the RAK e concept car, an electric two-seat commuter. They're all the rage this year. VW's stand was vast and way too bright for our liking. It was packed with new metal too. The up! made its world debut, alongside a handful of concept versions. The NILS is another concept - this time an electric single-seat thingy designed for urban commuting. Next to these babies the Beetle R looked positively huge. The Chinese-owned Swedish company had plenty of engine and technology news to tell us about, but we ignored all that to pore over the You Concept, a five-door fastback design. Does Volvo really plan to take on the BMW 5 Series et al in the future?